Charles Borromeo was born on October 2nd 1538 in Arona, Lombardy. His father was a count. His mother was a descendant of the lineage of the Medici. At the age of seven he started his education at a monastery where he received the tonsure and cassock in a small rite. 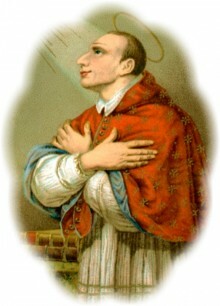 When he was twenty-one years old he received his doctoral degree (with distinction) in Canon Law and Civil Law. One year later his uncle, Pope Pius IV, appointed him cardinal and secretary of state. Later on Charles was vehemently opposed to nepotism and other abuses and consequently executed the decisions of the Council of Trent (1545 – 1563). Against the will of his relatives he was ordained priest in 1563. A couple of months later he was elevated to the rank of bishop and was consecrated Archbishop of Milan. By executing the reformed decrees of the Council of Trent Charles secured himself of a permanent position among the major reformers of the Church. He built seminaries, promoted study, reinstalled monastic discipline, founded new orders and Congregations and wrote a complete codex on pastoral law. He was known for his disengagement, penitence and self-denial. The failure of the harvest in the winter of 1570 in Lombardy, which threw many people into the deepest poverty, turned Charles into an authoritative organizer and devoted helper. In 1576 the plague cost his diocese thousands of lives. 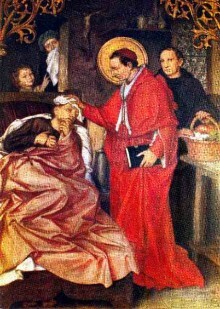 Charles went down in history as the shepherd who personally dedicated himself to plague patients and who parted with his possessions in order to solve the needs of the poor and the sick. In 1584, in the night of November 3rd to November 4th, he died, forty-six years old. He was buried in the Cathedral of Milan.